← What Makes a Good Home Page? What does it take to have a successful restaurant? Amazing food? Actually, not even that. To have a successful restaurant … you need a starving crowd. Your business has its own version of the starving crowd. It’s up to you to figure who’s starving. Or is it? Halbert goes on to say that once you know who’s starving, get their attention and give them what they want. If you have a successful business now, you’ve got a pretty good handle on who is picking up what you put down. But guess what? Those starving people can now find you! New customers, patients, clients, donors, whatever, tell Google their problem, and like magic (not really magic, more like an algorithm) up comes a menu of solutions providers. Often, the list is long, so you want those eyeballs to see your business name right in front of their eyes. Not an easy task! But we’ll get to that later. So now they found your website and it’s beautiful. They love the look. But they’re still starving because they can’t figure out in the first 3 seconds how you can solve their problem. This is pretty common when you’ve chosen a website builder like Squarespace. I mean, would you hire me to take photos at your wedding? I’m a whiz on my iPhone camera and have Photoshop, so why not? It’s just the most important day of your life. Well the same thing applies to your website. Write marketing copy or repurpose existing copy that is intelligently packed with keywords in the right tone and voice for your business. Build a navigation scheme around that copy that gets attention, raises curiosity, engages visitors so they spend time on your site, and finally, to get a visitor to engage or take action. Ask questions in order to know you and your business; do exhaustive research on the competition and outline a strategic marketing plan. (Clients often get more out of this process than any other). Refresh a logo or repurpose images to put your best face forward online. Implement and integrate SEO, social media, email marketing, blogging, e-commerce, CRM, and more. Provide for approval a written content document and a static mockup of the site before the actual site building starts. 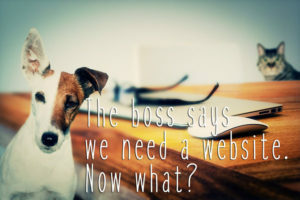 If you’ve thought about using a website builder, give us a call. We’ll buy you cup of coffee, lay out the pros and cons in a fair and honest way, and give you a chance to really understand your options. If we move forward, great. If not, no hard feelings and you never know what’s down the road. Just saying though, next time, coffee is on you. I like the Flat White at Starbucks. This entry was posted in business tools, web technology. Bookmark the permalink.